The Western Hockey League announced today that Swift Current Broncos captain Glenn Gawdin has been named the WHL On the Run Player of the Week for the week ending May 13, 2018. Gawdin, a signed prospect of the Calgary Flames, recorded six points (5G-1A) and a plus-three rating as he led the Broncos to their first WHL Championship since 1993. Gawdin was named the Most Valuable Player of the 2018 WHL Playoffs and was the first to lift the historic Ed Chynoweth Cup on home ice following the presentation in the final game of his WHL career. The week for the Richmond, B.C. product started with a hat trick in Game Three of the 2018 Rogers WHL Championship Series, helping the Broncos to a 3-2 victory in overtime and a 2-1 series edge Tuesday. After being held pointless in Wednesday’s 1-0 win in Game Four, his team had a chance to clinch the trophy in Game Five. While Gawdin scored twice in the contest, the Broncos were ultimately defeated, sending the series back to Swift Current, Sask. for Game Six. Gawdin would add an assist in the series-deciding game Sunday. He was named the First Star of the game in Game Three while also earning second star honours of the game in Game Five. He then replicated those performances in the WHL’s Three Stars of the night. Leading the Broncos in scoring during the 2018 WHL Playoffs, Gawdin recorded 32 points (14G-18A) in 24 games, finishing third in scoring among all WHL players in the post-season. Gawdin had 13 points (6G-7A) come on the power play with one short-handed goal and four game-winning goals. His 14 goals placed him in a tie for third in the WHL Playoffs while he was tied for third with 18 assists. Gawdin’s career in the WHL Playoffs have also been noteworthy, recording 45 points (21G-24A) in 48 games. Gawdin’s season to remember also included a spectacular regular season, where he recorded 125 points (56G-69A) in 67 games, one of three Broncos to eclipse the 100-point plateau in the regular season. He added 21 power-play goals, three short-handed goals, and eight game-winning goals. The 6-foot-1, 186-pound forward was originally selected by the Broncos in the first round, fifth overall, of the 2012 WHL Bantam Draft. In 312 career WHL regular season games with the Broncos, Gawdin recorded 313 points (126G-187A), including 34 power-play goals, three short-handed goals and 19 game-winning goals. This week’s honour marks the first time Gawdin has earned WHL On the Run Player of the Week honours this season and the sixth time this season a Broncos player has won the award. Gawdin and the Broncos will now compete in the 2018 Mastercard Memorial Cup, which is scheduled to begin Friday, May 18 (8:00 p.m. CT). The Broncos first game will come on Saturday, May 19 (2:00 p.m. CT) when they take on the QMJHL champion Acadie-Bathurst Titan at the Brandt Centre. Swift Current, Sask. – The Western Hockey League announced today that Swift Current Broncos goaltender Stuart Skinner has been named WHL Goaltender of the Week and league nominee for the Vaughn CHL Goaltender of the Week for the week ending May 13, 2018. Skinner, who was selected by the Edmonton Oilers in the third round, 78th overall, of the 2017 NHL Draft, compiled a 3-1 record, 1.49 goals-against-average, and stopped 134 of 140 shots for a .957 save percentage while also recording two shutouts as the Broncos claimed their first WHL Championship since 1993. The Edmonton, Alta. product began his week with a 37-save performance in Game Three of the 2018 Rogers WHL Championship Series, helping the Broncos gain a 2-1 series advantage with a 3-2 overtime victory. The next night, he delivered the first of his two shutouts in the week, stopping all 32 shots in a 1-0 victory. A 34-save performance followed in Game Five as the Broncos went down to defeat, but Skinner bounced back in Game Six at home, posting a 31-save shutout to clinch the series victory. Skinner’s performance in the 2018 WHL Playoffs featured him recording a 16-10 record with two overtime losses, a 2.20 GAA, .932 SV% and six shutouts. His 26 games, 1609 minutes, and 811 saves set a new WHL Playoffs records while his six shutouts also tied the current record. Overall, Skinner has appeared in 50 WHL Playoffs games, posting a 27-23 record with five overtime losses, 2.66 GAA, .922 SV% and six shutouts. Monday morning, Skinner signed a three-year, entry-level contract with the Oilers. Originally selected in first round, 17th overall, by the Hurricanes in the 2013 WHL Bantam Draft, the 6-foot-4, 200-pound Skinner has appeared in 207 WHL regular season games, maintaining a 104-72-9-6 record, 3.22 GAA, .908 SV% and 12 shutouts. 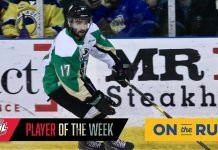 This week’s honour marks the sixth time Skinner has won the award since a mid-season trade brought him to Swift Current. Skinner and the Broncos will now compete in the 2018 Mastercard Memorial Cup, which is scheduled to begin Friday, May 18 (8:00 p.m. CT). The Broncos first game will come on Saturday, May 19 (2:00 p.m. CT) when they take on the QMJHL champion Acadie-Bathurst Titan at the Brandt Centre.